We are not suggesting that Audi’s sales staff are lazy, but if there was ever a brand that sells itself it must be Audi. Seemingly nothing, including the biggest scandal to hit the car industry in decades, can stop us for exchanging our hard earned cash for a slice of German premium motoring. But has the A1 reached this position on merit? There is one thing that Audi does better than the rest and that is perceived quality. 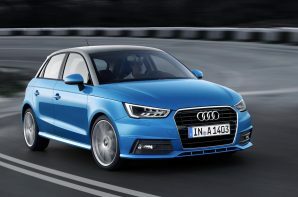 Despite its diminutive size the A1 looks like it is hewn from solid rock and achieves the trademark Audi front end treatment which even at this scale demands road presence. Hop inside and the usual styling cues are present and correct. What the A1 is missing is design flair, particularly inside, where it is all very corporate when most superminis aim for an element of fun. Equipped with the 1.0 TFSI engine performance and official fuel economy are right on the money. A three cylinder might not seem the obvious choice for a premium car but it keeps the weight down over the front axle and crucially keeps the purchase cost and running costs in check too. It isn’t the best of its breed giving away some low end drive ability but it is a credible choice. Once on the move refinement is OK but no better than the competition, whilst the ride quality is middling. We wouldn’t mind this if the A1 delivered a sparkling drive but sadly it doesn’t. There is plenty of grip but the steering offers very little feel and once you do breach the high level of adhesion the A1 falls into safe but dull understeer. So the A1 isn’t the best to drive, it isn’t the most comfortable, it doesn’t have the most interesting interior and it isn’t even that practical offering 270 litres of boot space. It is however fuel efficient, fast enough, surprisingly cheap and, well an Audi.